Freckles are concentrated spots of melanin – the thing in skin that gives it colour. Generally, people with freckles are super pale – except for where the freckles are. They are not moles. Moles are raised and sometimes hairy. They are not liver spots, which are dark spots that do not fade with reduced sun exposure. I wasn’t born with freckles. They started appearing in my early childhood as I became exposed to the sun I suppose. I always knew I had them but never paid it much attention until we moved from Quebec to Ontario. Our new doctor asked me how many I had on my nose and I answered “one” because that’s how many there were the last time I bothered to notice. He laughed and said there were way more than that! That’s when I realized that people noticed them. That it was different. Once, in grade school, I was having a slumber party where we were all watching Candyman. I went upstairs to use the washroom and started poking through the medicine cabinet (which is weird because it was my own house so I could have done that anytime). I found a jar of concealer and it said ‘for blemishes and spots’. I spent so long in the bathroom applying layer after layer to hide my freckles and finally have beautiful skin that my mother had to come get me to rejoin my friends. After washing my face. I was so aware of them I could feel them on my face. Each and every one of them taunting me with the slightest amount of pressure caused by it’s darker pigment. Somehow, mid-highscool, I got over it. Concealer made me look weird and caused major breakouts. The freckles themselves often camouflaged any zits I had so I was happy to just let my skin breathe and concentrate on more important things going on in my life (and by concentrate I mean merely cope with the horror that is being a teenager). Soon after, I worked at a shoe store that primarily serviced the blue-hair crew (although now it’s more of a middle aged crew). I was helping this one woman ( putting shoes on her feet, getting different styles based on what she needed, etc. ) and at the end of it all she said “freckles are so disgusting”. I don’t remember if I even responded. I know I had two major feelings about it. Now I’m totally ok with them again. I rarely think about them. In the summer They kind of all meld on my face into one über freckle, which is pretty neat. In the winter they get a lot lighter and only my oldest ones still show. When I was a toddler, our neighbours had bunnies which up until now I assumed were pets. Really though, they probably raised bunnies for their dinners. I remember going to see them a couple times and I remember my mother picking them up by their ears!!! I don’t think that’s right. I mean, if you think of the weight of their bodies and all of that being supported by only their ears, they were likely in a lot of pain. I remember being shocked at the age of 3 or 4 and my mom saying that it’s just the way you carry rabbits. I think though, she may have that confused with the way you carry a DEAD rabbit. So folks of the internet: Carrying live rabbits by the ears – totally cool or totally cruel? In 2007 – things I find annoying! In 2005 – The grotesque habit of new builds not suiting the neighbourhood. It’s basically scented vaseline. I’ve had this very tin since either 2002 or 2003. I Remember exactly when I bought it. I was visiting Sarah in Toronto and we went shopping at Urban Outfitters. I had hair long enough for a ponytail and I would pin up the front section. It was dyed more red than it is now. I bought an orange whirth with an asymmetrical neckline. It also featured a large black crow. I also bought a teal crewneck tee which I still have today. I chose my first pair of Tigers which matched both shirts. I saw the tin as we were browsing the knick knack/pos area and grabbed it because I had seen it in magazines and Sarah told me it was good stuff. You can see me wearing them after getting back to Sarah’s place in the image below. Hmm I still have that coat! I love that thing. It needs a new zipper. When I got tot he cash, they forgot to charge me for the shoes ($80 pre-tax) so while Sarah was flirting with a man-worker there about a heart pillow I rushed to her and told her we had to leave right away. We rushed off into the Eaton Center to make sure no one followed us to make me pay for the sneakers they just gave me. Since then I have moved 3 times. I have misplaced and forgotten about that tin and delightfully found it again many times. It’s still good! You would think it would be gunky by now but it’s not. And you know what? 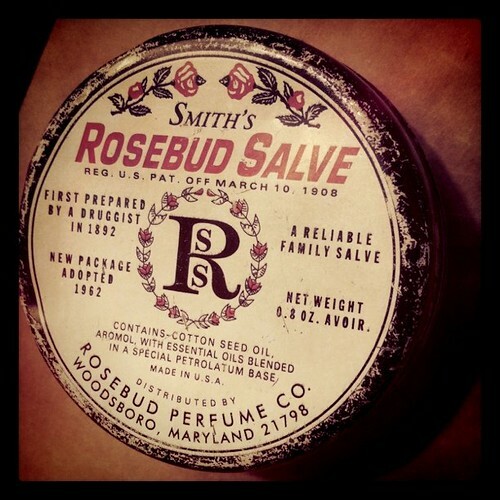 It is THE BEST THING for my lips that I have EVER USED. I love how beat up it looks and how it just follows me around everywhere. I love that I explicitly remember the day I bought it. Currently it’s sitting on my bedside table 1/2 full and saving me for the winter chappies. In 2004 – The day I became friends with Diana! As far back into my life as I can remember, I have been a nail biter. I’m not just saying that for the sake of a post. I have a very clear memory from before the age of 4 of me biting my nails and I highly doubt that was the first time. I’ve looked into it a bit and it seems that the only agreed upon cause for nail biting is stress or anxiety. I wonder what I was so stressed out about at that age? I definitely see it now though. I don’t always bite my nails and when I find myself doing it it clicks that there’s something gnawing on my mind which cases me to gnaw on my hands. It doesn’t even have to be anything ‘bad’, something as simple as thinking about all the things I need to do to prep for a dinner party sometimes sets me off. You may think I’m posting this because it’s a habit I want to stop. On more than one occasion, as a grown woman, I’ve been chastised for biting my nails, like it’s anybody’s business other than mine. Well I don’t particularly care if I bite my nails. What the hell is the big deal anyways. They are short? OH NOES!!! People might think I’m a man!!! I think it’s a fairly harmless way to deal with minor stressors. It’s not like my fingers are bleeding or infected and even if they were, it affects no one but me. It’s really astonishing that some people feel they have the absolute right to tell me "Stop biting your nails!" like they are doing me some big public service or I’m a stupid child. UGGHHH I started out just wanting to write about how I’m okay with my ‘bad habit’ and now I’m all annoyed. In 2005 – I feel the same way about the gym now as I did about pilates then. I miss those classes so much! Can’t anything be done just for fun? Subtitle: My professional career as a model, actress and olympic athlete. Do I start at the end or at the beginning? Well, there are three stories involved and since they all end in the same place, I’ll start at the end because you’ll know what it is by the end of the first story anyways. THE END – unless an activity was sure to make me rich or famous or both, my mom thought there was no point in persuing it. It’s one of those things that was never outright said, but now as an adult, it’s apparent based on the way things worked out. These three stories all take place at around the same time in my life. I’d say grades 3 and 4. My mom would read the classifieds and see ads for workshops for acting and modeling, promising a lucrative career (I also know that she was all into pyramid schemes too but those had nothing to do with me). I don’t know if she ever went to more of these workshops but I do remember her taking me to a couple. It was a big event. We took the subway downtown tot he Eaton Centre and went up into the office spaces. The first one was for acting. I was the only kid there (my parents didn’t understand the concept of not bringing kids anywhere they went – except vacations – they NEVER brought me on their vacations) and we were in a dark room watching a big tv with different commercials and a man would explain the most salient points about becoming a financially successful commercial actor. One point I remember him saying is that a voice over actor gets paid more than an on-screen actor. At the end of the ‘workshop’ the man told my mom that they had a group just for kids that she should send me to. It wasn’t running just then but he gave her a script for me to memorize and told her to bring me back. I was so nervous! I felt like I had to do a great job or else I wouldn’t make the cut (although I’m sure it was no audition or anything but I really felt like it was at the time) I was working very hard at practicing and being how I thought I would need to be for this commercial. My sister caught wind of this and was totally shocked. It was a tampon commercial. Remember when I said I was in grade 3 or 4 when this happened? I don’t know what went on between my mother and my sister but I do know that I never went back to that workshop. Not too long later, we took another special subway trip to the Eaton Centre. This time, it was to a ‘modeling agency’. We went in and my mom spoke to the lady at reception. I walked up and down an elevated catwalk a couple of times, making sure to make a nice turn and to show off my pockets. The woman reacted positively and then started talking to my mom about how much it would cost for head shots etc. These two events don’t really bother me because I never really cared about either of them. The next one made me resentful for quite some time. My parents signed me up for figure skating lessons at Seneca college. I really enjoyed it a lot. I wasn’t the best in my class but even at that young age I took a lot of pride in the progress I was making. The pinnacle for me was when the students of my class got to preform in a professional skating show starring Kurt Browning. We were all just little kids so I’m sure it was for comic relief between other big important parts but we practiced what we had to do for what seemed like months (was probably two classes). We went to the arena one night and I was put into a black and gold costume and my face was painted white in a very stereotypical ancient chinese fashion. I think I was even wearing a wig but I don’t remember for sure. We were all scooted out on the ice where we quickly skated around our pre-determined route and felt like superstars. Then we went up into the stands to watch the rest of the show. When my run of classes was over my mom came to me with some news. Apparently, my instructors thought I had lots of promise (probably all the kids in class had just as much really) and suggested that I change schools to a skate intensive school. I would skate before school, partway through the day and after school. I really wasn’t interested in leaving schools and all the people i knew for an unfamiliar situation (I hated change, I hated going places where I didn’t know what to expect). I said no, and I never had another skating lesson again. Why did it have to be all or nothing? Why couldn’t I just stay at my little French Catholic school and still go to skating lessons once a week? What is wrong with that? Why couldn’t I just ENJOY something without having to strive for Olympic gold? A post about being a stupid teenager. I moved to Ottawa between grades 10 and 11. I went from going to French Catholic school to English public school. The differences in the social interactions were vast. Shortly after starting school I met this guy and he was very friendly. We hung out a fair amount, mostly with his friends as well and it was all very fun and such. I liked him but also felt awkward about being in a new city and not really feeling like I fit anywhere. A few weeks later I remember having lunch outside the school and a couple of his friends were there and they asked me if I liked him and wanted to date him. Anyways I guess the whole point was that at that time in my life, I was so guarded about my feeling for fear of being judged by them. Like "OMG you LIKE him??? Well HE doesn’t like YOU HAHAHAHA!" Not that these people would have done that but that was pretty much my entire internal monologue until I was about 23 years old. So I played all my cards close to the chest. I wonder what my life would have turned out to be had I not been so socially inept as a teenager (although all teenagers are socially inept to varying degrees I’m certain). Not that I wish for a different life by any means. I know that I am where I am today because of every single moment of my past. In 2008 – it was a perfect swimming day, just like today but today I have no car and no one to go with. In 2006 – hahaha I love comics!